Soft crochet adds a seductive whisper to this bikini top from Becca, a lacy update on a halter silhouette. Simultaneously sultry and sweet, these sleek bikini bottoms from Becca feature sheer crochet at the sides for peek-a-boo flair. Pop princess: colorful crochet highlights the curves of Becca's halter bikini top. You're haute under the sun in this flirty halter bikini top from Becca, an alluring combination of sweet crochet and contemporary style. Mix up your swim look in these bikini bottoms from Becca, styled to sit at the hips with pretty crocheted tabs at each side. Cute and charming with a chic crocheted design, this pretty bikini top from Becca features adjustable straps that crisscross at the back. A stylish start for your swim look, these bikini bottoms from Becca are accented with a charming crochet design and a crisscross detail at the sides for an added whimsical touch. Taking the scenic route is the essence of a carefree lifestyle. These crocheted hipster bottoms from Becca fit right in with their boho design. Crocheted detail is the pretty focus of this tankini top from Becca, designed to elevate your swim style and complete with a built-in shelf bra and adjustable straps. 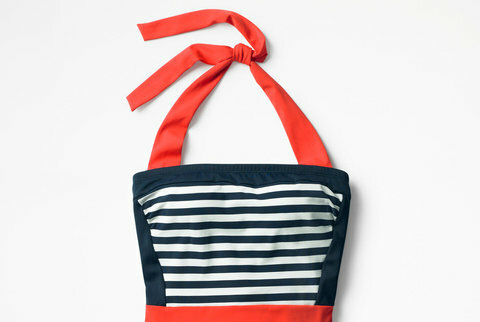 A cute monochrome bikini top that was made for mixing and matching. Becca's sleek style highlights a split band detail that allures at the beach. Becca reinvents your poolside style with this gorgeous bikini top, designed with a bold floral print and lettuce-style edging throughout the front. Chic crochet adds a boho vibe to these plus size bikini bottoms from Becca, with shirred sides for a flattering look. A new type of tropic: Becca's classic halter bikini top gets spiced up with warm-hued florals.